Vinaigrette: Whisk together the vinegar, mustard, honey and thyme in a medium bowl and season with salt and pepper. Add the olive oil and whisk until emulsified. For the potato salad: In a large pot of water, boil the potatoes until cooked through but not soft, 10 to 15 minutes. Drain and cool off with cold water to be able to handle them. Cut them in half, place them bowl with olive oil and sprinkle generously with salt. Place them in a cookie sheet and bake for another 10 minutes in the hot oven. 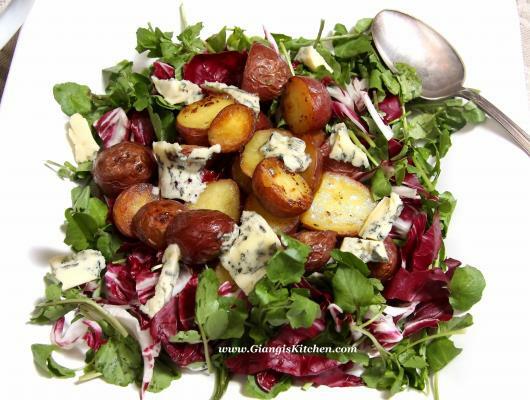 Arrange the watercress on a platter, top with potatoes and drizzle vinaigrette over the top and serve immediately. For the Chops: Season generously with salt, pepper and fresh chopped thyme. Cook on medium high heat for 4 minutes on each side. Each side should be golden crust. Place in the hot oven for 5 minutes. Remove from oven, give it a last searing on the stove. Turn the heat off and cover with aluminum foil. Transfer to a platter and spoon vinaigrette over each serving. I take almost a daily trip to my local grocery store to purchase our vegetable. The watercress salad looked beautiful and fresh. I have been wanting to introduce watercress to my little tribe for a while now, and here it was ready to be taken home. As I was turning around to place the salad in the cart, the bin with small gorgeous golden nuggets, all one size, yes, the potatoes bin was filled to the rim. I love potatoes and, if allowed, they will grace my every meal. Dinner was coming along in my head. So excited to have the fresh watercress for dinner instead of our regular spring mix salad. Change is a great thing when it comes to dinner. My family, on the other hand, has hard time with change, and the watercress was not high on their list of prospects of new food concept. This dinner is absolutely easy to prepare and quite open to let your imagination go wild and creative. Nuts, sliced pears can be added. Or dried cranberries or raisins. 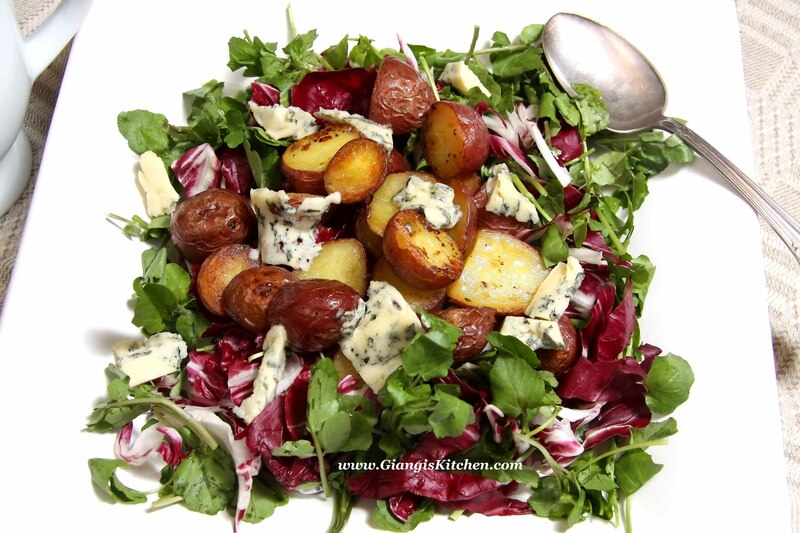 I used blue cheese because I love it and always have some in the refrigerator drawer, however some shaved pecorino would be wonderful with it also. Par-boiling the potatoes will help you on cutting time on the cooking process. Vinaigrette takes less then 2 minutes to assemble and can be refrigerated up to a week. Do not rely on my pictures, which are far from giving credit to the great flavor of the dish.